With 3.5 million manufacturing jobs opening by 2025, Bosch is looking to spread Industry 4.0 (I4.0) awareness to the Chicago Internet of Things (IoT) ecosystem. Ty Findley of Pritzker Group VC kicked off the discussion with a history of the global industrial revolutions—with the current one circulating around the Smart Industry, i.e. Connect Industry. As the Internet of Things increase device connectivity, it was noted that the most value from IoT will be in the industrial and manufacturing fields. According to Brad Feld, entrepreneur and author of Startup Communities, there are 4 pillars of a startup community—entrepreneurs, leaders with long-term commitment (over 20 years), inclusion of anyone who wants to participate and continual activities that engage the entire entrepreneurial stack. Referencing this to the 14.0 community in the Midwest, Ty Findley highlighted companies like Bosch specifically showing commitment to innovation and IoT/I4.0, saying that Bosch demonstrates this by opening the Chicago Connectory to fully integrate the company within the city and broader Midwest ecosystem. Currently, only 16% of manufacturers have an overall I4.0 strategy, and Smart Signal CEO Jim Gagnard from Smart Signal (acquired by GE) says that we are only in the beginning stages of this global transformation. “We’re only in the top of the 3rd inning with regard to Industry 4.0,” Jim said, comparing the I4.0 movement to a game of baseball. What is the hesitance with organizations buying into I4.0? Fear, according to McKinsey & Company Engagement Manager Brandi Bridges. Bosch Digital Services Business Development Lead Matteo Dariol says the adoption to the I4.0 model begins with a shift of mindset with the educational system. With 2 million of the 3.5 million manufacturing jobs by 2025 projected to go unfilled, there must be programs to properly train and integrate graduates into companies utilizing I4.0. 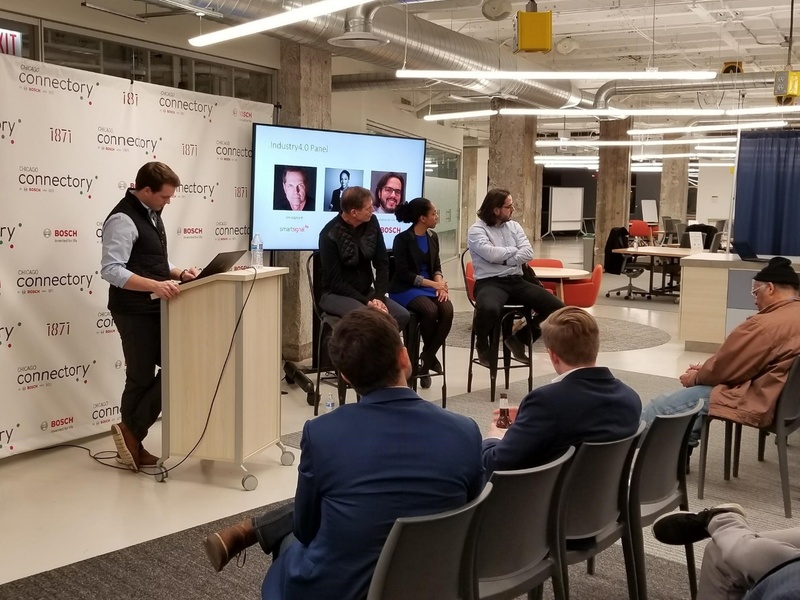 Ty Findley says his passion for Connected Industry is what led him to begin this tech series with the Pritzker Group. There will be six total parts to this tech series as Ty looks to host the event at other I4.0 locations, including mLab and TechNexus. For Rockwell Automation Consulting Associate Brian Ding, it was interesting to view the Connected Industry approach for companies in various sectors of the manufacturing picture. For the Connectory, this event provides yet another channel of communication to the IoT community as it looks expand its footprint. “With the goal of positioning the Bosch brand and building up the IoT/I4.0 community in the Midwest, the Chicago Connectory is looking to partner with industry experts and those specifically focused on IoT and Connected Industry,” Molly said. “Being able to host another new audience to the Connectory with this meetup helps us to continue building up that recognition."